Senior officials from East African nations last week agreed on a declaration on promoting investment in the region’s pharmaceutical sector, spelling out terms aimed at boosting investment in ways that are locally relevant and responsible. The declaration includes: steps to standardise and improve product quality and registration, boosting government procurement of local products, setting up research centres, adopting domestic laws on intellectual property and international trade flexibilities to IP, actions against counterfeit and substandard medical products, and increasing exports. The meeting comes as local pharmaceutical production is seen to be in decline in the region. xi) Noting the importance of Intellectual Property Rights, the governments of the EAC Partner States are called upon to implement the recommendations of the Regional Intellectual Property Policy on utilization of Public Health Related WTO- Trade Related Aspects of Intellectual Property Rights (TRIPS) [pdf] under their domestic laws. Josiane Nijimbere, Minister of Public Health and the fight against AIDS in Republic of Burundi addresses the participants at the conference. 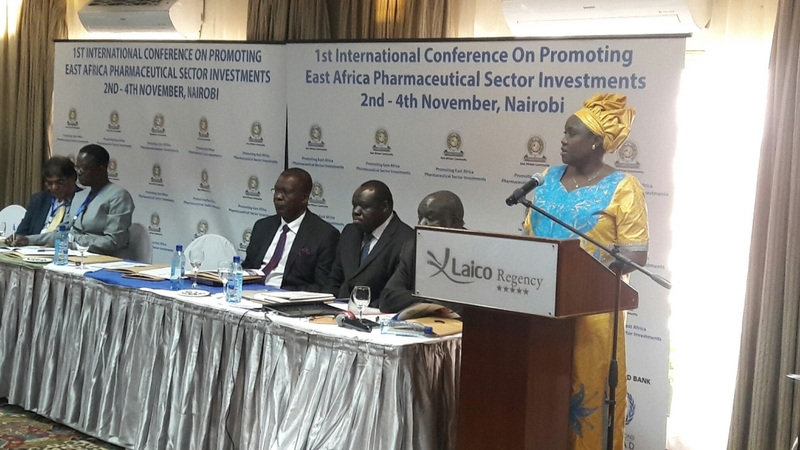 East African Community Secretariat; Arusha, Tanzania; 02 November 2016:The 1st International High Level Multi-Stakeholders Conference on Promoting Pharmaceutical Sector Investments in the East Africa opened today at the Laico Regency Hotel in Nairobi, Kenya. The three-day conference brings together key stakeholders from EAC Partner States including Ministries of Health, Finance and Industry, National Medicines Regulatory Agencies (NMRAs), National Procurement Agencies (NMPAs), AU-NEPAD Planning and Coordinating Agency, World Health Organization (WHO), United Nations Conference on Trade and Development (UNCTAD), United Nations Industrial Development Organization (UNIDO) and the private sector (local and international pharmaceutical manufacturers) as well as international development partners and investors among others. The overall objective of the conference is to develop a common and shared vision for promoting investments in the regional pharmaceutical manufacturing sector. In her speech read by Mr. Barrack Ndegwa, the Integration Secretary, Kenyan Cabinet Secretary for East African Community Integration, Labour and Social Protection, Hon. Phyllis Kandie described the pharmaceutical sector is a critical area of cooperation in health matters within the EAC. Hon. Kandie said the conference was therefore significant as it provides a platform for stakeholders to have a conversation among the policy makers, industry players, the civil society, as well as social and development partners on how to deepen cooperation in the sector. She disclosed to the conference that in 2014, the pharmaceutical market of the EAC was valued at US$1.9 billion, adding that it was forecast to grow at a compound annual rate of 8.3% to reach US$4.2bilion in 2024. However, Kenya, which is the leading pharmaceutical producer in the region, with approximately 50% production and rising exports, supplies just 25% of the Kenyan market. The CS added that Tanzania supplies a declining share of its own domestic medicines market, down from 35% in 2009 to less than 10%-20% today. 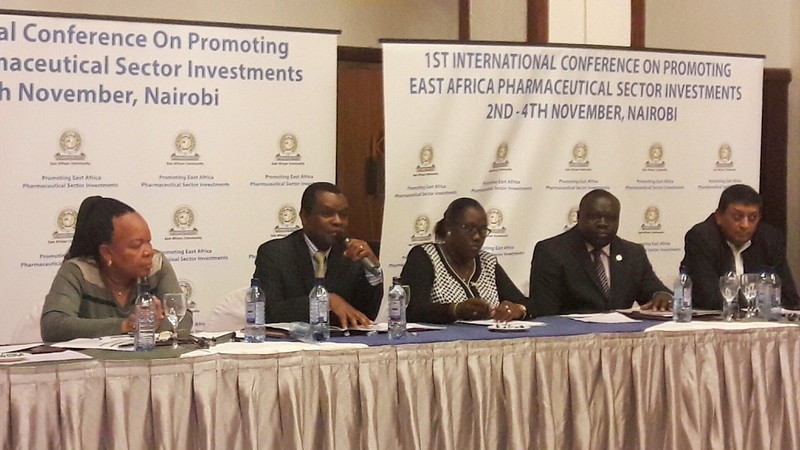 The Cabinet Secretary informed the participants that despite these developments, the Pharmaceutical manufacturers operating from within the EAC region generally produce at a cost disadvantage to larger generic product manufacturers internationally due to a variety of reasons including scale, expensive asset base coupled with older technology, higher financing costs plus a lack of integration with active pharmaceutical ingredients suppliers. She called for the Development Partners and other stakeholders to support the growth of the sector by engaging and addressing the concerns of the domestic pharmaceutical manufacturers and potential investors. On her part, Hon. Josiane Nijimbere, Burundi’s Minister of Public Health and the Fight Against AIDS, said medicines have become a very important and powerful tool, now more than ever, in improving the health status of populations and, in the long term, for reducing healthcare costs and ensuring sustainable development through health working human resource. She underscored the importance of the health sector for the citizens of East Africa as the EAC integration agenda aims at improving sharply standard of living the East African Citizenry. The EAC Deputy Secretary General in charge of Productive and Social Sectors, Hon. Christopher Bazivamo said that poor performance of the EAC health sector has contributed to shortage of essential medical products and health technologies, which could be produced within the region by EAC industrial sector. “About 75% of the EAC pharmaceutical market demand is met through importation of medical products and health technologies while 25% is covered by domestic pharmaceutical production,” said Hon Bazivamo. He urged Partner States to consider implementing incentive packages to promote domestic pharmaceutical production in the region which includes; a uniform preferential margin of 20% for all regionally produced medicines and medical devices in public tenders according to Article 35 of the Common Market Protocol; removal of duties for imported raw and packing materials, pharmaceutical manufacturing related equipment as well as spare parts for the equipment’s acquired by domestic manufacturers registered in the EAC; and classification and import restrictions for finished pharmaceutical products that can be produced within the region, based on regional capacity and quality audits of local manufacturers. The High Level Mult-Stakeholders Conference on Promoting Pharmaceutical Sector Investments conference provides an opportunity and a platform for stakeholders to discuss and agree on strategic areas and policy incentive packages that promote EAC domestic pharmaceutical manufacturers and foster dialogue between policy makers, regulators and pharmaceutical manufacturers. The Conference has been organized by the EAC Secretariat in collaboration with the EAC Partner States and Development Partners. "East African Nations Agree Declaration Promoting Regional Pharma Sector Investment" by Intellectual Property Watch is licensed under a Creative Commons Attribution-NonCommercial-ShareAlike 4.0 International License.